I carry one in the glove box, one in the center console, and one in the trunk of each vehicle. There are one or more in each room of the house. There is one on each nightstand in the bedroom, with a 6-D cell in the corner near the bed, and one on the dresser. Each bathroom has one in a drawer. TSKnight, Primalgunner and G26Raven like this. I carry way to much stuff to keep my back pockets clear. My hand-held is in the same front pocket as my spare mags. TSKnight and Pete63 like this. When I carry a light, it is a single AA cell Bushnell in my right pocket along side my spare mag. That little light is inexpensive but quite reliable. It has been through more than one wash and dry cycle and functions perfectly, always. TSKnight and G26Raven like this. nope... nope, i'm just going to leave it alone. Well, yes the same basic stuff here (older pocket dump). A newer phone. The XD service .45 acp has been replaced, with this Redhawk in .41 mag. at about 1:30 IWB. And I carry an XD subcompact .40 in an OWB 11:00 position (no pic available currently) also. XDs .45 acp still in rt. front pocket, & G20 is IWB at about 4:30. Snub44 and kerberos like this. That Redhawk WOULD complement a flashlight very well!!! Pete63 and TSKnight like this. Over the years I’ve grown tired of certain methods I was using. Now I’m not a shorts person due to long winters and my good weather days are spent on my motorcycle unless something else arises. Anyway, I’m very found of my carpenter jeans. I find the pocket on the side of the leg fits decent sized to small powerful flashlights comfortably. There is also a smaller pocket below that for betterys, spare mag, even a mini revolver I imagine I could fit my naa in there. Don't like Jeans! Worn 511s since I bought my first pair on a visit to the FBI Academy, many years ago. Bill Vanderpool was a Chap I met at an IALEFI Annual Conference, 1985? Wore them ever since. Love the pockets! Florida shirts, sweaters. Fell in love with with the end cap, on and off. SureFire. Metal lens cap. With serrated rim, weapon strike edge. First push of the button, light for reading? Next push, so bright! Was told, "You will be taken for an off duty Cop?" Re 511s? Maybe in 1985, now the whole World wear some form of Multi Pocket pants! Every guy in Europe owns a pair. I lived in Toronto then. Glock makes cheap belt slide, $13.00 Holster, also mag pouches. Take a G19/G17 mag pouch, sit it in the kitchen sink. Run the hot tap on it. Till it softens up. Force the nose of the light into it, till it fits, takes a while. Had it for years. First mag pouch on off side holds a G17 magazine, behind that, the flashlight. News Flash! Wore my new Glock 43X Blue Box 9mm last night, to an HOA Meeting! Weighs nothing! No printing at all. 11 rounds? Compared to 16? Back to the G19 4th gen today. I know! Must say, use the flashlight a lot more than that spare mag! Found a cut diamond in a Jewellery Store Gig, the Sales staff piddling little flashlights didn't cut it. Very expensive stone! Sometimes have it examined on plane flights? As it sits in the box. my phone is my EDF = every day flashlight. 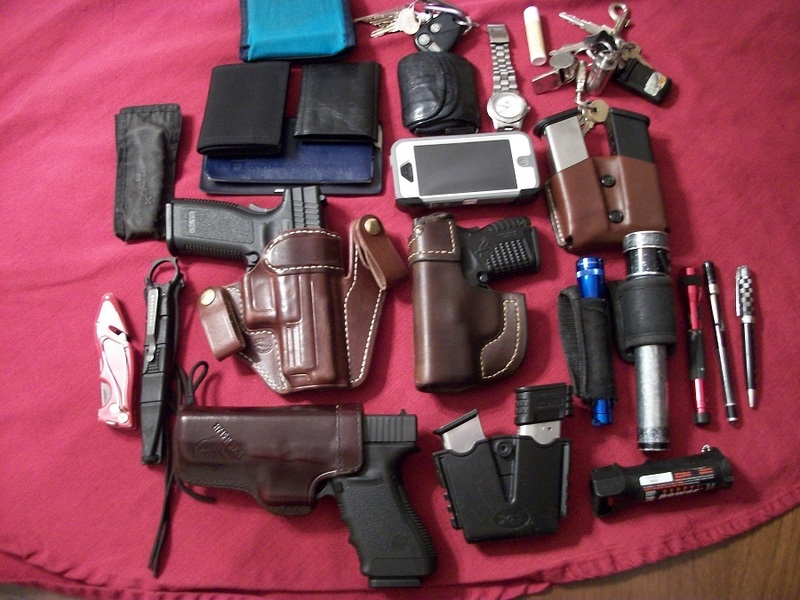 An Uncle Mike's number 4 pocket holster in the front left pocket holds a spare mag and a flashlight. A very small rechargeable LED on my key chain. It's certainly not suitable for use clearing rooms or the like, but it's handy and available when a larger light isn't always. It's surprisingly bright too. 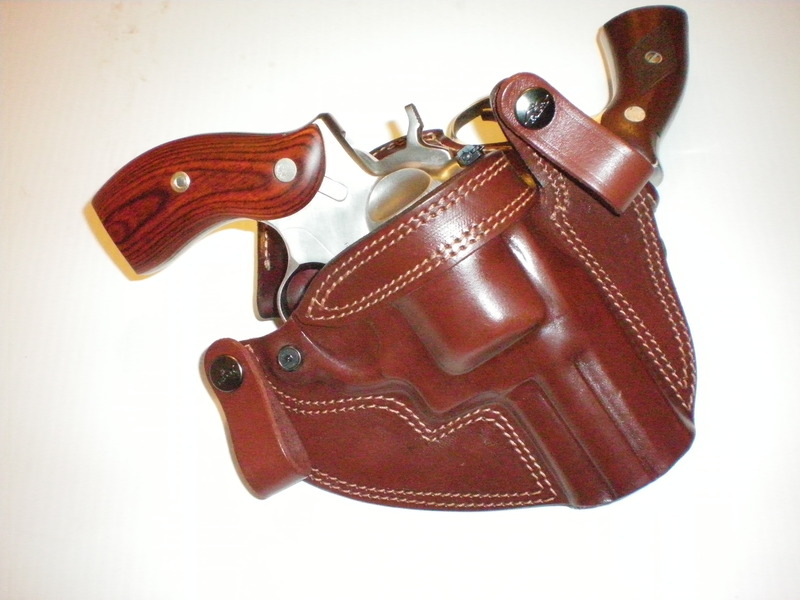 Stream light Protech HL – X 8 o’clock on my belt in holster it came with. Two Revolvers, Two Reloads, every day, all day.